One of the most awarded brandy houses in the world, our very own KWV, hosted a convention challenging event to launch two South African brandy milestones as well as their brand new campaign #FINISHGREAT. The idea behind the #FINISHGREAT campaign is not only in the exceptional craftsmanship of KWV’s products, but the everyday man achieving small victories in everyday life and celebrating those victories by finishing great with a glass of KWV Brandy. In the wake of their award winning streak the past two years (ISC World Best Brandy 2013 & IWSC World Best Brandy 2014) KWV just pushed the bar even higher by launching South Africa’s own Cognac and their own (way overdue!) Nexus 30 year old brandy. Pieter de Bod and his team really out did themselves with these two magnificent products, so let me not keep you in suspense any longer and give you all the delicious brandy details! Just in case you didn’t already know, if a liquor is labelled Cognac it means the grapes were grown, fermented, distilled, aged and bottled in the Western France region of Cognac under very strict rules and regulations. KWV formed a collaborative partnership with the French House of MaisonCharpentier to develop South Africa’s very first and very own Cognac. Pieter de Bod, master distiller of KWV took 20 different Cognacs between the ages of 12 and 30 years old and penned a symphony of exceptional blending to create a world class Cognac by any international standard. It comes in a beautiful bottled marked with a logo true to the heart behind this collaboration, two keys that represent two continents, two tradition rich distilling heritages, but one extraordinary Cognac. I think the implication of this product, not only as a South African first, is quite important. It adds to bridging the gap between the esteemed and well recognised Cognac industry and the high quality ‘hidden gem’ of South African brandy. This is a great way of introducing international markets to South African brandy houses and quite possibly opening the doors of those houses to a larger and wider international audience. 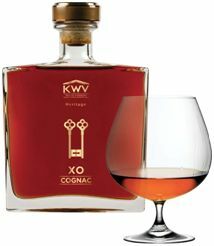 Ultimately I believe that although not being a brandy, the KWV Heritáge XO Cognac can be recognised amongst the brotherhood of brandies as a vital contributor to our passionate industry and benefit everyone, consumers and producers alike, in the long run. To truly understand the significance of this potstill brandy, I have to try and put into simple perspective; since the first South African brandy was distilled in 1672 on board the Dutch ship De Pijl anchored in Table Bay harbour only two 30 year old brandies have ever been released. The well-known Au.Ra 30 Year Old from Van Ryns and now the KWV Nexus 30 year old brandy. As explained by Lourens Stander from the KWV team, back in those days nobody really anticipated to release such an old brandy and nobody ever planned for or wanted to mature this long. Nobody knew the significance. It is through recent planning (and maybe the luck of a few forgotten barrels) that we can today enjoy such a premium matured and sophisticated product. The other significant point to understand about the uniqueness of this brandy, as explained by Pieter de Bod,is that after approximately 20 years a brandy develops the flavours called Rancio. This is identified by notes of exotic mushroom, walnut oil, complex specific aromas that develops with long term maturation and intensified with time. After this time the brandy mellows out and at about 30 years maturation we start to see the brandy reach equilibrium and no further development happens. This is usually the peak of the brandy. Due to climate differences between South Africa and France, we often see Cognacs only reach this point at around 50 years. So do not be fooled by 50 year old Cognacs being much more impressive than our 30 year old brandies, because both of them are fully matured spirits. This idea is also captured in the name of the brandy, with Nexus meaning the highest point of a connection. Just to ensure that this brandy is truly something exceptional, Pieter de Bod & Co increased the blend to range from 30 to 42 years old placing this brandy firmly in the position as one of the most extraordinary potstill brandies the world has to offer (and quite possibly the oldest 30 year old around). So now that you can better grasp the significance of this product, let’s start delving into the detail. What better way to store and show off such impeccable craftsmanship than through a hand blown crystal decanter made by renowned glass artist David Reade (same guy who made the decanter for the Au.Ra) and sealed by handmade Baltic Amber stone set in copper by award-winning jeweler Maike Valcarcel. This beautiful bottle is protected, and accentuated by a handmade interwoven wood casing that represents the journey of unsurpassed craft, patience and attention detail. I was privileged enough to taste this rare and exceptional brandy and let me tell you… WOW! It is a beautiful rich golden colour, but it is not the colour that is pulling you to the glass like a moth to the flame, it is knowing what is inside, the years of dedication and work put into it, the angel share, the care and meticulous nature of the craft and the pure skill to blend all the unique components into one masterpiece. You lift the glass to the nose and you are immediately greeted by a strong note of honey with underlying green peppercorn. The more you nose it the more the secret flavours comes to light. You are introduced to soft scents of strawberry jam and dried orange peel. After the initial volatiles have evaporated and you can fully take in the nose, you realise the strong honey comes back but this time greeted with a balance of cinnamon, nuts and well integrated old woody tawny port. At this stage your mouth is watering for this golden elixir and you take a small sip. You let it roll over the tongue and swallow slowly… It gives a soft tingle to the tongue and you immediately pick up the spices, caramelized fruit and roasted coffee bean flavours. It was difficult to identify and enjoy each individual flavour because this brandy is so well put together and lingeringly smooth. It is incredibly well balanced but exceptionally intense. You sip, you savour, you enjoy… And I couldn’t help but sit there with a sly smile on my face and enjoy this magnificent brandy. A true gem to the eye, the nose, the palate and the soul.